Microsoft takes a different approach to co-editing in Google Apps. Collaboration – sharing information in different ways with colleagues, customers and suppliers – is one of the great attractions of cloud computing and has already started to reinvent how people work together. Microsoft promises that collaboration is a central goal of its cloud productivity suite Office 365, but it has taken a different approach to co-authoring documents, one of the key pillars of collaboration. Google Apps allows co-editing where two or more people can edit the exact same part of a document or spreadsheet. Microsoft allows users to co-author the same document, however they cannot edit the same paragraph. And unlike Google Docs, users do not see live updates from other users. In its research Microsoft found that having multiple real-time edits happening on the one page was very distracting. Instead, co-authoring in Office 365 automatically locks the paragraph on which a user is working. Co-authoring users see updates only when the document is saved back to Office 365. Many of the Office 2010 applications such as Word natively support co-authoring. This means multiple people can open Office documents via the desktop applications and work on them concurrently. This is all supported by default and when multiple people are working on a document each user receives notification of who is working on the document. Once a document is refreshed, users will see parts of the document highlighted to show edits by others. A user can give exclusive access to a document by “checking it out”, a metaphor similar to borrowing a book from a library. Other users can only edit the document once it has been checked in again. There are some limitations when it comes to co-authoring in Office 365. For example, it is currently not possible to co-author Excel spreadsheets on the desktop but it is through Office Web Apps. The reason is that Excel recalculates every time a user enters information which could change values throughout the spreadsheet. The Office Web Apps version of Excel does not yet have all the features of the desktop edition but it does allow co-authoring. It is expected that all Office applications will support full co-authoring in future. For more detailed information about Microsoft Office co-authoring take a look at this article from Microsoft. Firstly, I’d like to say to Microsoft for the recognition and secondly I’d like to tell you why I personally do this sort of thing. Many years ago, over 15 to be exact, when I started my business I was pretty much alone trying to not only solve customers technical issues but also run my business. I can tell you there were plenty of times when I struggled and I mean really struggled. Perhaps in some ways I thought I could do it all but more so I think I just didn’t know where to turn for help. These days, with easy access to the Internet, most people think that answers are just a search engine away. Yes they are BUT someone out there actually needs to spend the time documenting solutions and sharing their experiences. I do it because I know the feeling of not being able to find the information and having the feeling that you are all alone in trying to resolve something. However, there are still times when I ask whether it is worth all the effort. A little recognition now and then goes a long way in supporting the people that actually create all the content that others search everyday. So I do thank Microsoft for the recognition and suggest that if you do find someone out there that has helped you, make contact and let them know that their voluntary work has been worthwhile in at least one case. I have learnt that “community” is a very important concept, even in the digital age. One of the killer features of Office 365 is Lync (along with SharePoint) simply because it provides features that many businesses have never experienced including presence, chat and web conferencing. Lync is the successor to Live Meeting that came with BPOS (the previous incarnation of Microsoft Online Services). At the release of Office 365, recording options will be disabled in the Microsoft Lync 2010 client for legal and privacy reasons. Because certain countries and nationalities require permission from all parties to record instant messaging (IM), audio, and video conversations, the Lync Online engineering team decided to remove this feature until a future update is released to address this. Recording options will be re-enabled after the update is released and deployed to Lync Online. So the powerful ability of Lync to record all conversation through it has been disabled pending an update. I can understand the reasoning for this but I gotta say that being able to record meetings was one of the real selling points of Live Meeting in BPOS and not having it available in the Office 365 upgrade kind of puts a dent in that when speaking to prospects. Like I said, I understand why it has been removed but I’d like to know how long it will be before that ability is restored. Another issue to add the list of things I hope they fix during the next update to Office 365. I really wish I had read this book when I first started out in business. It contains so many of the things that I have discovered to be true over the years but would have loved someone letting me know ahead of time and saving me the heart ache. I also found the no nonsense style of writing very appealing. At first glance, the title of the book can be deceiving. Put those fears aside and read it, you’ll be glad you did. This is a book that will challenge your perception of being financially successful and give you a practical formula to what brings results. As with many successful ideas you’ll probably have to go against the grain and do things differently from what is generally accepted. This is where this book will challenge many misconceptions and provide recommendations on what really drives success. For some, the book may be very confronting and this could perhaps turn readers away. However, in many respects if you really want to be successful you need a jolt to make you think, to challenge the path you are on and help you understand what you want to achieve. Being a fan of the four hour work week I was a little disappointed that it was referred to in a negative light. However, upon further consideration I accept that many people do not understand the principles it espouses. The same could be said of this book which covers many similar concepts but in a different way. Neither book encourages ‘quickie’ solutions, they challenge the reader to understand what they want and how to practically achieve it. All in all, I would highly recommend this book and have included as one of my preferred business books to revisit on a regular basis. I found that it provided excellent information as well as solutions that you can implement. It is certainly easy and enjoyable to read. Don’t let the cover fool you, this is a must read book for anyone who truly want to achieve the freedom to live their dreams. The book isn’t about short cuts or fantasies it is about doing the hard yards but doing them in practical and intelligent manner. Any sales provides me a small commission that I put back into obtaining books to review. In Office 365 there are range of licenses for different suites. The P SKU is the one aimed at Small Business and Professionals. It is also priced to compete directly with Google Apps (read cheap). The documentation for P SKU’s was that they only included ‘community support’. This mean that if you purchased these you’d really get no ability to log tickets or get a guarantee of up time. Here in Australia, for customers with less than 125 licenses, Office 365 is sold through a major telco (Telstra). All the information I had seen from Telstra indicated that the Australian P SKU’s would also come with ‘community support’. Wanting to understand exactly what was and was not provided by Telstra here I pursued the matter for clarification. That is certainly great news for people on these P SKU’s but it raises some questions in my mind. Firstly, although this is good for resellers who support customers on P SKU’s I feel it may mean that such customers will seek out Telstra’s assistance first before contacting their reseller. The clients typically on the P SKU’s are going to be looking for the cheapest method of support and if Telstra is providing it free with P SKU’s where does that leave the reseller? Secondly, does Telstra really know and understand the extent to which they are going to get support calls from P SKU customers? Are they going to help them set up their workstations? Are they going to help them do migrations? What happens when Office 365 being to scale up? Are they going to able to cope with the inevitable flood of support calls from customers? Are they also going to support customer issues on PC’s that appear to be Office 365 related but aren’t (as is typically the case). This is a real can of worms from Telstra’s point of view and I don’t think they have thought through how demanding the lower end of the SMB market will be. To me, Telstra also hasn’t thought through the impact of this provision of support for its resellers as it certainly appears they are cutting the resellers out of the loop and that is not going to do anything for that relationship (which they say they are trying to build). I am still awaiting full information about exactly what is and what is not supported on the Office 365 P SKU’s. When I know I’ll post it here along with my comments. 1. Smaller customers are doing their own IT work. When asked whether they were using managed services from their new IT providers or simply using ad-hoc services, both said they couldn’t see much need for managed services. Why? Because most of the basic technology skills are pretty common or easily found using search engines, few are willing to pay for basic IT services. What does that mean for your traditional IT reseller who believes managed services are the be all and end all? Simple, it ain’t. Traditional managed services will continue to work for those customers with legacy on site infra structure but if you want to sell cloud managed services you are going to have to rethink your business model, period. 2. Customers know what they want and more importantly want their needs taken seriously. The experience of one customer on stage demonstrated at how ‘old world’ most resellers are. The customer said they went through several IT providers and not one provided any option of moving to the cloud. When quizzed they all said it was a bad idea but didn’t really provide anything further than that. The client wanted to reduce their costs and complexity. They had done their research and they wanted to move to the cloud. That should be a wake up call for traditional IT resellers. Your clients want to move to the cloud. They are doing their own research. They want to see at least the option worked into quotes. If you fail to do that as a reseller you look old, tired and obsolete. Worst of all, chances are the customer will go elsewhere. 3. The cloud delivers excellent solutions. Both clients where extremely happy and surprised at not only how well the process of migrating to the cloud went but also what additional functionality was available to them. The main reason for both customers initially moving to the cloud was for email but once they got into Office 365 they discovered the wealth of possibilities around SharePoint and Lync. SharePoint and Lync represent the greatest opportunity for resellers to benefit from Office 365. Most customers have not seen what either product can do. There is also a wealth of additional consulting services that can be tied to each product that most customers are clambering in their business. SharePoint and messaging have been around for a while now so there is no excuse not to have some expertise in them. If you don’t then someone with the skills has the opportunity to step in and speak to YOUR customer in language that appeal to them. If this happens the chances are you’ll be more and more sidelined as the online relationship develops potentially to a point where you are no longer part of conversation. I fully agree that two customers don’t make a majority but they are the saying the same thing I’m hearing and seeing from others out there. If you are a traditional reseller and you ignore this then you do so at your own peril, because at the end of the day you have no business without the customer. With Office 365 P Professional and Small Business (P) plans you are required to switch the name server (NS) records to point to Office 365 hosted name servers. Office 365 Enterprise (E) plans do not require this. Once the domain has been added to the P Plan Office 365 will automatically create all of the other DNS records (MX, TXT, SPF, etc) needed to run Exchange Online and Lync Online in the domain. Once the domain has been verified in Office 365 you can create custom A and CNAME records using the Office 365 DNS management features. If you want to hosted email and instant messaging with Office 365 but host a web site with a third party you can accomplish this with Office 365 domain management. Office 365 P plans only currently support creating custom A and CNAME records. You cannot create SRV, TXT, etc records with Office 365 DNS management tools at this time. 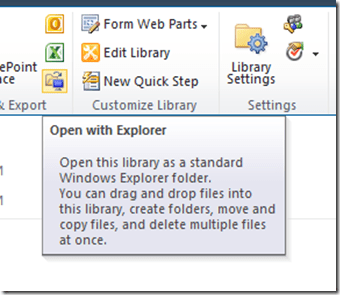 Many locations in SharePoint can also be accessed directly via Windows Explorer (file manager). To do this simply navigate to the location you desire. Then click the Library tab in the top centre of the window (to the right of documents in this case). This will reveal the command ribbon as shown. 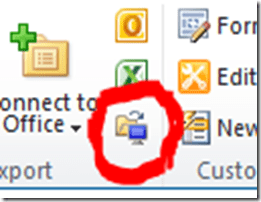 To the right hand side of the ribbon, under the Excel icon you should see an icon that appears as a computer and folder as shown above. If the icon is greyed out it probably means you are using a non IE browser. Such interactions with Windows requires viewing SharePoint in Internet Explorer. Once you click this icon, and wait a few moments as Windows Explore is launched, you should see a list of the items from SharePoint displayed. You can now drag and drop as well as work on these files directly as you would any other normal file in Windows. Beware that one of the down sides to using Windows Explorer to manage files in SharePoint is that additional columns (metadata) are not active.